This is great news for automotive industry manufacturers and distributors of aftermarket parts, right? There are always two sides to every coin and there are big challenges that come with the growth of the automotive market place in the UK. The biggest threat downstream to the aftermarket parts business is maintaining customer service expectations while keeping costs under control. With an ever expanding supplier base, increased “Do It Yourselfers” (DYI), e-commerce eco-systems like Amazon and increased competition, distributors need to focus on customer service more than ever. The nature of the aftermarket parts industry means that parts are required quickly to ensure that vehicles are still usable or serviced as soon as possible. In today’s buyer climate, customers will not wait around for your shipment of parts to arrive. They will move on to the next distributor and not look back. More over, a delay in supplying parts means more than just a lost sale; it means that suppliers will lose business to their competitors. The harm caused to a business’s reputation by repeatedly failing to ensure that demand is met can be irreparable. Conversely, regularly having parts available leads to improved brand perception, a more loyal customer base and growth in parts revenue. Automotive Distributors have an interesting dilemma when it comes to the projected industry growth. On one side, there is potential for competitively placed distributors to capture more market share and larger revenue potential. On the other side, growth can cause unexpected growing pains. Growth means that more resources, time and energy is required to service a growing customer base. Distributors that do not have the right people, processes or technology in place to support this growth will struggle to keep up with the competition and can actually hurt their business by not servicing customers well. Most automotive distributors have smart people and long standing processes in place to manage day to day operations. What about technology? When it comes to technology, most automotive spare parts distributors use the inventory management module of their ERP system to support purchasing, demand forecasting and planning. Not all ERP systems are created equal and most distributors are at the mercy of their system’s inventory management limitations. To further complicate the situation, the ERP business landscape has reached a saturation point, where businesses in the wholesale and distribution industry have almost too many options. There are currently many systems used by aftermarket parts suppliers to manage inventory including some of the bigger players; Microsoft Dynamics NAV, AX and GP, SAP Business 1, Bespoke, PeopleSoft and JDEdwards to name a few. There are of course the “home grown” systems built in house by more daring distributors. 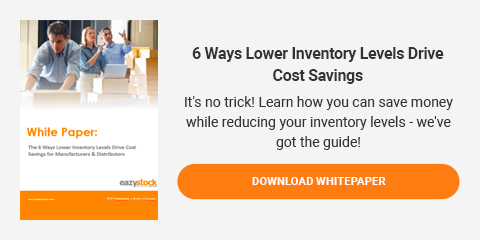 Even with inventory management as a core module within these ERP systems, there is a large gap when it comes to effectively managing adequate inventory availability while keeping costs down. Spare parts management, in a competitive fast moving industry like automotive, requires a dedicated inventory optimisation system to support more advanced inventory analysis than what is traditionally offered by ERP systems. The expansion of the UK automotive aftermarket industry will have a lasting effect on the distributors of automotive aftermarket spare parts. Competition will become more fierce in the next few years and it will become more difficult for new and existing distributors to gain market share. Business sustainability will be a big challenge, and the only way that parts distributors will remain competitive is by keeping their customer base satisfied. Stock optimisation software is an essential tool for managing the successful flow of inventory while ensuring customer satisfaction and profitability are maintained. As the motor industry grows in the UK, quality stock optimisation software will be fundamental to helping businesses develop sustainable business models and ultimately maximize profitability beyond what is capable with only Enterprise Resource Planning tools or Warehouse Management Systems.